It’s unclear how the blaze began. 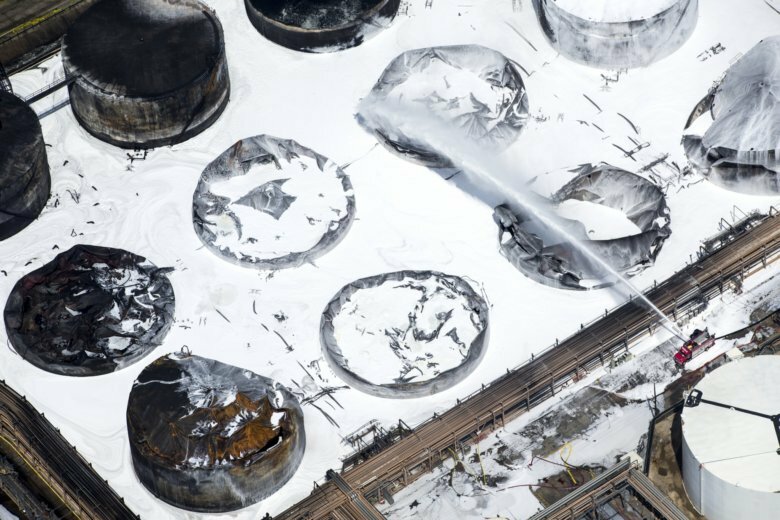 Some of ITC’s tanks leaked oil products and a containment area was breached Friday, leading to the mixture reaching the ship channel, said company spokesman Brent Weber. “The priorities remain ensuring the safety of our on-scene responders as well as mitigating any impact to the waterway or the environment and reopening the Houston Ship Channel,” Oditt said. Oditt said officials have performed several test runs with ships, letting them pass through the affected area to see if they don’t interfere with the cleanup and don’t get contaminated. Such test runs will help the Coast Guard determine when the channel can be fully opened. Diehl said the channel is 52 miles long and other sections have remained open. As of Monday afternoon, some ships were being slowly taken through the area that had been closed to make sure they didn’t disturb the cleanup. That section, for now, is only open to daylight transits, Diehl said.